The building had solid bones, but it had been neglected. The roof hadn't failed yet, but needed to be replaced. 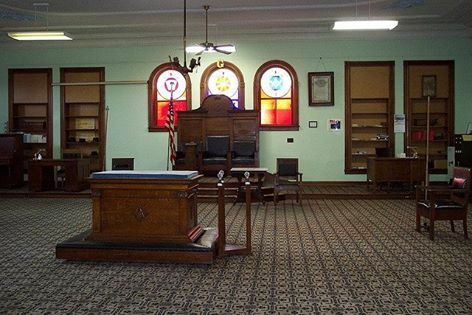 As our District Deputy Grand Master had so painfully pointed out during his visit, the lodge was a mess. The closets were full of junk. There was a spare room full of junk. The lodge was dirty and disorganized. The lodge needed some plaster and some paint. Several areas needed carpet. But two members stepped up and lead the way--Denver Phelps and Dave Harry. They took it upon themselves to begin the process of cleaning up the lodge, making some basic repairs, and start going through the junk that had collected for decades and begin hauling stuff away. A third member, Greg Knott, had some ideas about how to get some funds lined up to replace the roof. The other major issue was membership--there weren't many members of the Homer Lodge that were actually from Homer. Most of the active members of the lodge were dual members from another local lodge--Ogden Lodge No. 754. The idea from the inception was to build the membership of the lodge back up again, and then hand the keys of the the lodge back over to true Homer Lodge members. The challenge of building the lodge back up was obvious--almost nobody in the community was even aware that the lodge was still open. That's what we heard over and over again, "Homer Masonic Lodge? I didn't even realize they were still in existence!" So the first thing we did was to start letting people know we were still there. We started a Facebook page. We got a few small pieces about the lodge placed in the local papers. And the community of Homer has a number of annual events in town--an annual Soda Festival that brings in around 10,000 people each year, an annual town celebration called Crazy Days, and an annual day-long Fourth of July celebration that included a parade and fireworks event. Every time there were people in town for one of these events, the Lodge determined they were going to be there. We poured sodas at the soda festival. We had an open house during the Crazy Days celebration and gave tours of the lodge in the midst of its renovation. Once we got the dust flying during the initial clean up stage, and the buzz going as the local residents realized Homer Lodge No. 199 wasn't a thing of the past, we started building some excitement among our members that maybe, just maybe this was really doable. And something similar began to happen outside the walls of the lodge as well--interest began stirring about our lodge in the little town of Homer, Illinois. But that was just the beginning. What we discovered next, hidden away in the attic, was truly remarkable. I'll tell you all about that in Part 3.